"I've got an orgastic future with your name on it, baby." I wanted so much for this film to be good and I spent far too much time dreaming up possibilities and wondering what I was going to see. It was therefore with Gatsby-like levels of hope, that I sat down last night to watch Baz Luhrmann’s The Great Gatsby. Ten minutes into the movie I was ready to give up. It takes Luhrmann approximately 90 seconds to establish both the film’s aesthetic and a convenient (if rather silly) frame story. I was pretty sure I would know early on whether I liked what Luhrmann was doing with The Great American Novel™ and after ten minutes or so I thought I did. But then I channeled my inner Nick Carraway. I reserved judgment. Remembering how much I hated the first 30 minutes of Moulin Rouge before ultimately coming to adore it, I decided to give Luhrmann some room to sell me on his vision, even of this most sacred of stories. With every zoom across the bay between the Eggs, every glass filled and every flapper flapped, I began more and more to buy in to what Luhrmann was doing. Before long – and indeed, when the credits rolled – I found myself with a pretty unexpected feeling of satisfaction. Not elation. Not blind devotion. But, rather, certain contentment about this adaptation of a story so many hold so dear. As my friend pointed out on the way home – and as I suggested in my previous post – adapting Gatsby to film is in many ways a losing battle. The story is so wedded to its medium that no translation to another medium is ever going to feel like it’s doing justice to the original. As the film played, it gradually became clear to me that Luhrmann understood this – my principal anxiety – and had constructed his adaptation in a way that both acknowledged and allayed it. And that’s when I let go my inhibitions and simply decided to let Luhmann show me his vision of this story. I understood that (unlike the Watchmen filmmakers), Luhrmann wasn’t trying to reproduce the novel word-for-word, but rather wanted to capture its spirit, its essence. And I think he largely succeeds. I didn’t walk away from the film thinking “That WAS The Great Gatsby. Full stop.” But I’m pretty sure that wasn’t the point. Instead, I felt like the characters were all plausible versions of the people Fitzgerald sketched (in some cases, with admittedly minimal development) as part of the fable/myth/cautionary tale the novel is. Once I allowed myself the liberty of viewing the film in this way, I became immersed in a movie experience that was compelling, moving and – yep, I’m sure of it – ultimately satisfying. Luhrmann makes plenty of subtle nods for the die-hards (the “gypsy” girl in “trembling opal” comes to mind), but he’s taken liberties here without a doubt. Some aspects are exaggerated (the Gatsby-Daisy romance, the symbolism of the green light and the eyes of Dr. TeeJ) while others are downplayed (Myrtle and George Wilson) or excised entirely (virtually all of the Nick-loves-Jordan stuff, the visit of Gatsby’s Dad, the self-improvement list). But that’s the nature of adaptation. And this is the most essential thing you must remember when watching the film: that it’s an adaptation. I know that sounds like an aesthete’s Get-Out-of-Jail-Free Card, but it’s really true here. As with much of Luhrmann’s previous work, careful removal of the stick from your sphincter (here’s looking at you, Anthony Lane) will result in your actually having a pretty good time. As someone with a sizeable such stick (wait, what?) when it comes to this novel, I should know. In many ways, Luhrmann’s Gatsby is the love child of his two best-known projects: Romeo+Juliet and Moulin Rouge. I said in my previous post that Luhrmann’s prior work actually encouraged me going into the film and I stand by that having seen it. I think those two films lent him the experience he needed to pull off this one with conviction. The Moulin Rouge influence is obvious. The decadence and prodigality here are somehow more awesome and appealing (I mean, *ahem*, deplorable) than in Rouge, where the parties had actual prostitutes. So, yeah. Sign me up. And like Romeo+Juliet, this film stretches the limits of the word “adaptation”, while remaining in other ways totally faithful to the much-beloved original. I actually really enjoyed the music and its uses, just like I did in R+J. much of the music in Gatsby is used the same way: that is to say, atypically but effectively. Luhrmann has a knack for capturing the spirit of a moment, even if the music isn’t contemporary. Here, as in R+J, I thought it worked very well. The Gatsby-Daisy relationship is undoubtedly played up more in the film than it is in the novel. To some, including the friend I went with, that will feel like Hollywood grafting its blockbuster movie checklist onto a sacrosanct story. But Fitzgerald himself admitted that he didn’t do enough with the emotional exchanges between Gatsby and Daisy when he wrote the novel. Many have argued that the novel isn’t even a love story. Luhrmann clearly does see it as one and I’m fine with that. Leo and Ms. Mulligan, while not perfect, are good enough thespians to make us believe it. I don’t think Fitzgerald would have an issue with adaptors imbuing the Gatsby-Daisy relationship with more affection than he originally wrote into it. The novel, like most fables, is more concerned with plot and symbolism than it is characterization and I think what some perceive as “stock” in his characters, I tend to view as elasticity. All of them have some degree of intangibility. This makes them ripe for interpretation and also explains why we keep going back to this story: we want to see if we can get just a little clearer picture of who these impossible people are. As a filmmaker, Luhrmann has no choice but to give us that “clear” picture and so we are inevitably going to find faults in his choices since he has embodied something which, in the novel, is hazy at best and left up to us to imagine. This goes back to the differences between storytelling in prose and on film which, if I talk about again, you’re probably going to punch me. Let’s move on. I disagree with the “stock” argument, but I will give you a quick take on each of the character portrayals, most of which it will probably be hard to find consensus on. Daisy – Fitzgerald’s whole plan with Daisy was to make her the most desirable girl in the world, and Carrie Mulligan certainly isn’t that. She pulls off Daisy’s problematic and oft-described voice pretty well, but isn’t utterly irresistible. Like Emma Watson in Perks of Being A Wallflower, she’s fine and doesn’t get in the way, but totally nails the one scene she has to. In this case, that’s the “Tell Tom you never loved him” climax in the hotel room. I did not leave the theater thinking “Yup. That was Daisy” but she was probably the most plausible version of an impossible character we have seen so far. Tom – Joel Edgerton is pretty solid as Tom, especially in the third act when tensions finally come to a head in that scorching room at the Plaza Hotel. I really did believe that Daisy once loved (or thought she loved) this man, which is, of course, essential to the denouement. Jordan – Doesn’t quite steal the show, but certainly emerges as the most plausible 20s woman of the the bunch. She is lithe and mysterious – and I actually thought there was more to her voice than Daisy’s, ironically. This actress made me want to see the missing scenes where she’s driving with Nick and he pulls her close. Each time she was on screen I thought, just for a minute, that I loved her. Myrtle – Is in the movie for approximately 4 minutes total and is largely innocuous. She’s different enough from Daisy (red hair!) for us to understand her point, but Isla Fisher isn’t given nearly as much to do as Myrtle is in the novel, which makes her tragedy pitch a little lower. One of the most egregious places where the film simply can’t (or elects not) to capture what Fitzgerald is up to in the novel. George Wilson – A little too Neanderthal. In the end, I think Fitzgerald’s characters themselves give us the cues we need to appreciate and enjoy the film. We need Nick’s penchant for reserving judgment. We need Daisy’s unadulterated affection for all things glamorous. 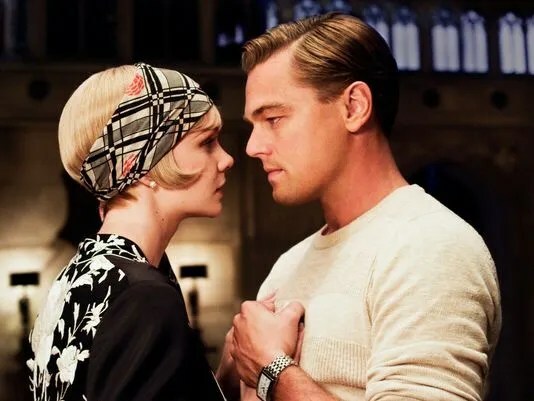 And most importantly, we need Gatsby’s “romantic readiness”, but not his unwavering and stubborn devotion to some ineffable ideal that we have in our heads – in this case, for what we want the film to be. It simply can’t be the book and, thankfully, it doesn’t try to be. Nick was right: you can’t repeat the past. But you can adapt it.